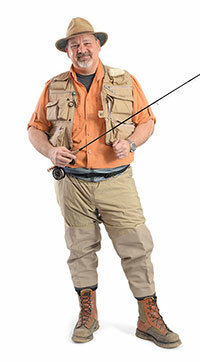 Vested Interest: A fly fisherman’s vest is more tacklebox than garment. The one I’m wearing has dozens of pockets, loaded with flies, tools and other gear. Net Gain: My net is split willow, designed for catch-and-release fishing. A Little Dab: That orange disc contains a paste that helps flies float. Called Dab, you just dab it on. Flash of Brilliance: This flashlight’s adjustable beam and clothing clip make it handy when needed. Navigation, Old-School: GPS is helpful, but I rely mostly on notes from past trips and maps of streams. All-Purpose Flask: May contain scotch. Possibly Lagavulin, Islay single-malt. Closeup: Just below the flask, these flip-up magnifying glasses clip on the brim of my cap and really help when handling tiny flies. Dry-Ur-Fly & Glide: Two coatings—one to dry your flies so they float properly and the other to help your line flow easily through the guides on the fishing rod. Cigar & Cutter: Fishing isn’t just about fish. Part of the pleasure sometimes is a good cigar, which one could rationalize as mosquito control—but I don’t. Mack: The knife has interchangeable blades, all ridiculously sharp, to fillet what we catch or to open that bundle of steaks back at camp in case dinner doesn’t come from the stream. 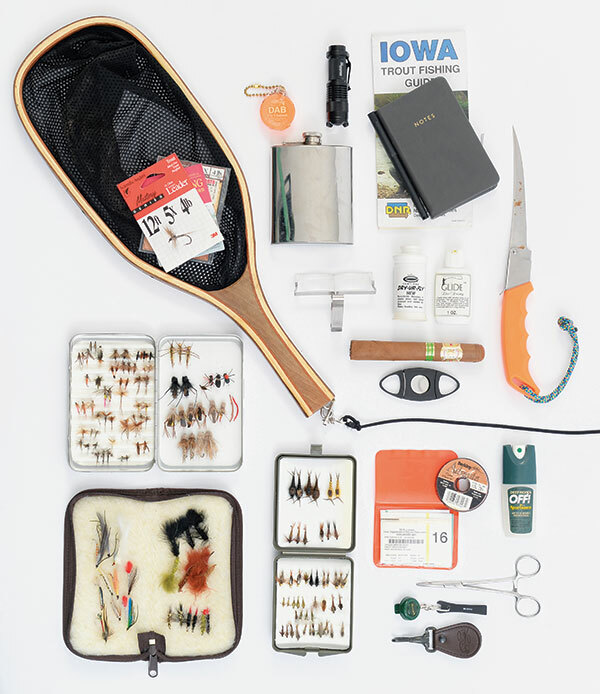 License to Carry: You need to carry a license to fish legally. I keep mine dry and handy in this orange vinyl case—and this photo reminds me it’s time for a new one. The adjacent disc contains tippet material, the thin, nearly invisible line that presents the fly to the fish. Forceps Plus: My fingers are too big to hold tiny flies. This helps. So do the line nippers below it, attached to a lanyard that clips onto my vest. Looking like a key fob, the item at the bottom is a pair of leather tabs that remove the coil in line that is pulled between them. Flies: Trout want to eat more of what they’ve been eating, so the fisherman’s first step is selecting a fly similar to bugs on and around the stream. So I carry wallets and cases of flies in my vest and change them to suit my surroundings. Sometimes it works.